Monday I took the kids swimming and met 2 friends at the pool. We had an awesome day at the pool and after we spent almost 5 hours swimming we came home and I put Suzy and William down for naps and Jack and I crashed on the couc h. (Isabella is at camp this week) Jack was not happy about laying down...so I thought I'd lay with him to calm him down a little. After about 15 minute s I feel asleep but awoke to Jack twitching and fidgeting. Not unusual for him. He wasn't happy about taking a nap in the first place. We were going to a birthday party that night, and I wanted him to rest up. I told him to knock it off or he could go down and lay in his bed. He still kept messing around, so I told him to go downstairs and lay in his bed to rest. I was half asleep. He got up and made his way to the kitchen to go down. I lay there and listened to what sounded like him throwing a fit on the stairway. Like a temper tantrum because he didn't want to go down. I laid there for about a minute listening to him and got up to find him on the floor in a seizure. He was unresponsive to me talking to him. He was laying on the floor unable to move his legs. He was trying to talk but made no sense. His arms were flopping on the floor. His eyes were roll ed back. I ran out to get Donovan who was mowing the lawn. Who came in and helped me move Jack to the couch. The seizure lasted about 3-4 minutes. We called 911, and the ambulance came. By the time the paramedics came Jack's seizure had ended. His eyes were fully dilated and he was confused and but could answer various questions correctly. Like do you know where you are, your name, how old are you? The paramedics recommended he be checked out by the hospital, so we had a neighbor come to stay with Suzy and William who were sleeping and we drove to hospital. They ra n tests on Jack along with a blood work up and urinalysis. Everything checked out normal. They said sometime kids who are over tired can have seizures and we would chalk this one up to exhaustion. We were to follow up with our pediatrician the next day. They also gave us instructions if he has another seizure to come back to the ER. So we were discharged and got home about 9:30. By the time we got the kids in the p.j. 's and to bed it was almost 11 p.m. Jack was exhausted (like the rest of us) and he fell asleep immediately in our bed. I went to take a bath and when I got out of the bath I h eard this moaning, I ran into our bedroom to find Jack in another seizure. This one was very different. Jack's arms were stiff and straight up in the air. His lower body still unable to move, he made a choking noise as if he couldn't breath. He was turning grey and his lips were turning blue. He kept looking up at the ceiling and could not talk to us. From when I got into my room and noticed the clock said 11:11. I timed his s eizure and it lasted 5 minutes. I felt so helpless, while I was holding Jack during this seizure it felt like he was dying. It was hard to tell if he was breathing, and he kept making such an awful noise as if he couldn't breath. William was still awake and scared. He saw everything. I didn't have time to explain what I didn't even understand myself. We called 911, called Donovan's parents, and the neighbor to stay with the kids until Donovan's parents could get here. The hospital admitted us, started an IV with medication ready and waiting if he would seize again. They took us up to the 3rd floor about 2 a.m. We slept as well as we could, I snuggled right next to my little sweet 7 year old in his hospital bed. He was hooked up to heart monitors, a pulse monitor and IV. I was thankful that the nurses could monitor him from their station, and we could sleep. Jack woke about 5 a.m. yesterday morning with no clue where he was or how he got another IV in his arm. I explained what he couldn't remember and he went back to sleep. We all slept until 8:30. Our pediatrician came to talk to us and recommended an MRI and EEG also was requesting Jack be seen by a Neurologist. Last night about 6:00 we talked to the Neurologist who evaluated Jack and gave us a game plan. He explained to us that some seizures are unexplainable in why they happen. Jack's seizures were not typical. And because he had 2 close together he recommended a medication that would prevent them from happening again. During both of Jack's seizures no harm was done to Jack or his brain. However seizures lasting for 20-30 minutes can cause permanent brain damage. So the nurse started the medication by IV last night and his 2nd dose orally this morning. He will be on this medication for 1-2 years. It will hopefully work to keep all seizures away. It's not a guarantee but this medication usually does take care of them. There are also several o ther medications we can try for his age, if these have adverse effects to him. Jack's EEG did come back with some abnormalities. Showing a tendency to seizures. We are thankful there were no masses or something life threatening causing these seizures. The neurologist is hopeful that Jack could out grow seizures or that he may never have another one on this medication. I am praising God for letting us keep Jack. So many things could have been different in the last 3 days. I'm thankful I was able to be there with him (as horrid as it was) d uring his seizure. I'm thankful he wasn't riding a bike when his seizure hit. I'm thankful for this to remind me how precious life is and how much I take it and our family for granted. I'm thankful for Donovan's parents who took care of Suzy and William, thankful for caring neighbors who came to help us. Thankful for my family and friends who support and call. Thankful for my sister who met us at the hospital and stayed with us while we waited, and brought us meals. I'm thankful for the meatballs and potatoes baking in my oven right now left in my frig by my little pregnant friend. Jack is great. He is his old self, full of spice and energy. At the hospital he had full access to his re mote that controlled his bed, feet up, head up, feet down, head down....he was loving playing with all the controls. He also loved having a remote that controlled full access cable. THEN....he ordered from a kids menu that was brought to his very cool bed. At breakfast yesterday he told Donovan, "I am living the dream dad!" Eating breakfast in bed WHILE watching cartoons. So please pray for Jack if you think of him this week. We are also scheduled to close with our house on August 11, moving on August 10th. So we have a lot of things changing around here. 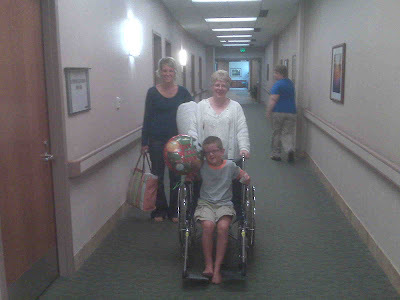 Leaving the hospital today....sorry bad quality from the camera phone. My quote of the day comes from Rose's little girl, Sophie. They came to visit at the hospital last night...and during the visit she went to whisper something to her mom. I found out later this is what she said.... Sophie: "Mom, if I get sick like Jack...I want this exact room." Jack had been showing her the controls to his bed, the remote to the TV and his birdhouse he got to paint. Heather, we're praying for Jack as well as the rest of your family. So glad God had his protective hand on him through this very scary time. Glad we could talk today. Heather, glad to hear Jack is OK. I'll continue to pray for him. It sounds like an awful experience, but I'm glad God also allowed the situation to be better than it could have been (on a bike, alone, etc.) I hope the move and closing go well also. I thank you for Jack and his sweet personality. Thank you for protecting him. I pray you will continue to heal his body. I pray also for comfort and peace for Heather and Donovan. Thank you that you are faithful and thank you that you are a great Healer. May the Gingerich family be richly blessed in the days to come. Amen! This is my prayer for all of you. Oh Heather! How heart wrenching as a Mom when you can only hold them while their body is out of control! I too did this for Mitch 2 years ago when he fell and hit his head which caused a major seizure. At the bottom of your post I couldn't help but notice the title of your previous post. "learning to let go ... just a little" or something like that. Isn't that what all these uncontrollable moments in our kids' lives teach us? They ultimately belong to God! Tough lessons to learn with our Mommy hearts! Love you all and hugs & prayers! Heather ~ So thankful that Jack is doing so much better....we will keep your family in our prayers and pray also that the move will go smoothly! I am so thankful Jack is ok! We're praying for the little guy! Love ya! I learned on FB about what was happening with Jack.... I've kept him in my prayers along with you and Donovan. Remember to not only take care of Jack but, yourself as well... Keep us posted! Heather I am praying for you and Jack and your family. Praise God, He is our Healer! Keep us updated. God bless you. Holy cow Heather! I had no idea!!! Thank goodness you were able to be right there with him! We will keep you guys in our prayers! And if you need help with packing boxes or moving, let us know! Oh my word, Heather...that must have been awful! You must be just totally stressed out with that happening and trying to get ready to move, etc. Oh my gosh, as I was reading this I got tears in my eyes. I can't even imagine how you were feeling during the seizures!!! Wow! I pray that this medication will work & keep any more seizures from happening. I'm praying for you all as you adjust to this new aspect of your life & also the move! How is William doing since he saw the 2nd seizure? He will be in my prayers Heather...I just can't even imagine how you felt. I also want you to know that after teaching for 10 years I OFTEN had children in my class that had seizures as children and then eventually grew out of it. It would be safe to say I had one in my class nearly every year. I hope that brings you some sense of peace. Hi my friend... I finally got on your site to read again...I am so glad Jack is better now!